Ross D. Franklin/APAt an Arizona Quick Trip, gas prices were going down on Friday. If you've been to a gas station in the U.S. at all in the last month, you know that the price of gas has been dropping like a rock. According to GasBuddy.com, the price of gasoline has fallen from $3.26 a year ago to $2.61 recently -- and the savings for consumers are starting to pile up. The driver of the drop in gasoline is the price of oil, which has plunged from more than $110 in June to below $60 now, a level not seen since 2009. And the price keeps falling. Brent Crude Oil Spot Pricedata byYCharts. 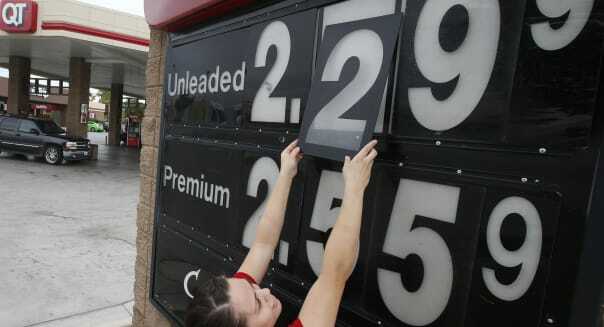 Falling gas prices can quickly add up to savings for consumers, and you may already be noticing the difference. The U.S. Energy Information Administration predicts that the average household will spend just less than $2,000 on gasoline next year, a savings of $550 from this year's total bill. Incredibly, gasoline prices are down since a few days ago when the prediction was made, so the savings could be even bigger if the price of gasoline continues to fall. On top of the cost savings on each gallon, U.S. drivers continue to use less gas than we used to. Since 2005, oil consumption in the U.S. has fallen 8.8 percent due in large part to more fuel-efficient vehicles. If consumers don't suddenly rush out to buy Hummers now that gasoline is approaching $2 per gallon, this trend should continue, saving consumers even more money. Not only are gasoline prices lower than a year ago, the EIA is also predicting lower winter heating costs than last year. The average home heated with natural gas is expected to save $30, or 5 percent, compared to a year ago -- and if you're using heating oil, you could save $64, a 15 percent savings compared to a year ago. Combined, consumers should be saving around $600 on energy in 2015. That money will likely go straight back into the economy, fueling economic growth outside of the energy sector. It's no guarantee that low energy prices are here to stay, but there are some positive long-term trends. Oil drilling has picked up in the U.S. and in countries outside of OPEC, flooding the market with supply and pushing prices lower. With OPEC losing its ability to control prices, we could see a new paradigm in energy. There are also more energy alternatives than ever before. Solar energy can save consumers money in parts of the country, electric vehicles are eliminating some consumers' demand for gasoline, and even natural-gas-fueled buses are becoming increasingly popular for metro transit. Add it up and the U.S. could be spending less on energy for many years to come. This is the question economists are asking. According to the Census Bureau, there are about 116 million households in the U.S., and if they all have $550 more to spend next year, it could mean a $63.8 billion boost for non-energy industries in 2015. Or if they choose to stash the cash instead, it could cause savings rates to go up, reducing debt in the economy and stabilizing personal finances. 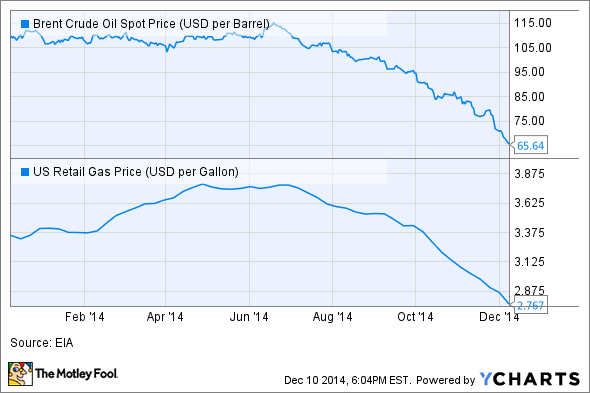 There are multiple potentially positive side effects of lower energy prices. What we do know is that discretion over what consumers are spending on will increase if energy prices stay low. You may not have a choice whether or not to fill up your gas tank on the way to work, no matter the price, but you do have a choice about whether you'll spend energy savings on things like clothing or home improvements, or put the cash in the bank. What consumers do will tell us a lot about economic growth over the next few years. Travis Hoiumis a Motley Fool contributor. Try any of our Foolish newsletter services free for 30 days. Looking for an investment to put your energy savings in? Check out The Motley Fool's free report onone great stock to buy for 2015 and beyond.